Police now say they have identified the terrorist who blew himself up on Tuesday during the Riverside Complex terror attack that left 21 people dead. 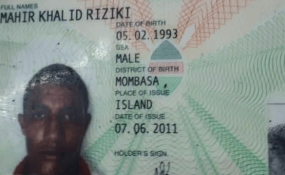 Police officers involved in the investigation said the man is 25-year-old Mahir Khalid Riziki, who was born and brought up in Mombasa. "Khalid is the one who blew himself up out there," a police source said, "we are trying to establish the identities of the four others. He said to have been radicalised by an Al Shabaab militant named as Ramadhan Hamisi, who is said to be in Somalia. The Anti-Terrorism Police Unit profiling him said, they had established that he has been previously involved in attacks that mainly targeted security forces and has previously travelled to Somalia. Footage from a CCTV recording from the scene shows the terrorist walking outside a manicured lawn before he stands outside Secret Gardens, where he is passed by two people who seem oblivious of what he was doing as he appears to speak to the phone before he blows himself up. Police officers investigating the terror attack said suicide bomber killed six people in the process, and is believed to have arrived at the complex and stayed at a hotel room from where he walked down while communicating with other attackers who shot their way in. Six suspects were arraigned at a magistrate's court on Friday, and police have been allowed to detain five of them for 30 days to facilitate the ongoing investigation. The fifth will be produced in court on Wednesday. Those presented in court include, Joel Ng'ang'a Wainaina, Oliver Kanyango Muthee, Gladys Kaari Justus, Guleid Abdihakim (Canadian) and Osman Ibrahim--all believed to have facilitated five Al Shabaab terrorists who launched the deadly attack described by Foreign Affairs Cabinet Secretary as having targeted the world. The sixth suspect was arraigned separately, and police were allowed to detain him until Wednesday. Another suspect is said to have been seen, in surveillance footage reviewed by investigators, talking to one of the attackers at the dusitD2 hotel complex where the al-Shabab linked militants laid a siege that started on Tuesday at 3pm and ended on Wednesday morning at about 9 pm when four of them were all killed. The first terror suspect blew himself up outside Secret Garden hotel, killing six people--according to police. Police had earlier said they were holding 11 suspects, but it is understood that some of them are still being interrogated before a decision is made on whether they should face charges while others have been freed. Papers filed in court on Friday stated that investigators are still pursuing more persons linked to those already arrested, both within and outside the country. A detailed chronology of those arraigned in court indicated that they had been arrested between Wednesday and Thursday. Wainaina was arrested around MP Shah Hospital in Nairobi on Wednesday, while Muthee, a taxi driver was arrested on Thursday. Kaari, a mobile-money transfer agent was arrested in Maua, Meru County, on Wednesday, Abdihakim, a Canadian national, was arrested on Thursday. The fifth suspect, Ibrahim, was arrested at the Two Rivers Mall in Nairobi on Thursday. Police were also allowed to detain the sixth suspect named in court documents as Hussein Muhamed, until Wednesday next week. The magistrate directed that he be held at Kilimani Police station. The court was told that the suspect, who was presented separately from the five, was arrested on Jan 16 in Mandera, and his phone analysis shows he had been communicating with well-known terrorists based in Kenya. The prosecution pleaded with the court to be allowed until Wednesday as they await identification documents of the suspect, which they said were being brought to Uganda.